Looking for the perfect floor tile for your kitchen? Our range covers so many different styles, from high performance porcelain tiles in gloss and matt finishes, wood-effect planks which are great for ease of maintenance, and a range of stunning natural stone tiles which will provide you with the kitchen floor of your dreams. 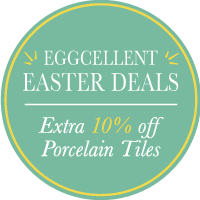 Shop our range to today and find your perfect tile. With the trend for open plan living and large seamless spaces becoming more mainstream we also have a range of kitchen floor tiles perfect for adapting to this new spacious aesthetic. Our XL sizes are available in polished porcelain, concrete effect, natural stone and wood-effect styles. Maybe you’re looking to bring a modern country look to your home? We have a host of kitchen floor tiles that meet this description, with brushed multicolour slate options and a wide selection of natural sheera multicolour slate tiles available to your to choose from. Antique limestone is another popular option, with grey, black and Jaipur versions available from Stone Tile Company. These tiles really set off other elements within the kitchen space and work beautifully with wooden furniture. If you’re looking for a natural aesthetic however want a bolder look our popular Black Slate is another strong option available in a brushed finish too, perfect for under-floor heating in bear-foot areas. Black Granite tiles also provide a beautiful contemporary look and allow your kitchen to really meet modern design standards. Our range of porcelain floor tiles are perfect for kitchen floors with amazing polished porcelain to wood-effect planks you can achieve the look you want even on a budget. As well as our fine range of kitchen floor tiles, we also have a great range of kitchen wall tiles. Be sure to check out our full range and match up these important elements of your kitchen. And don’t forget to take a look at adhesive, grout, sealer and cleaner options, which will help you keep your tiles looking great after purchase.